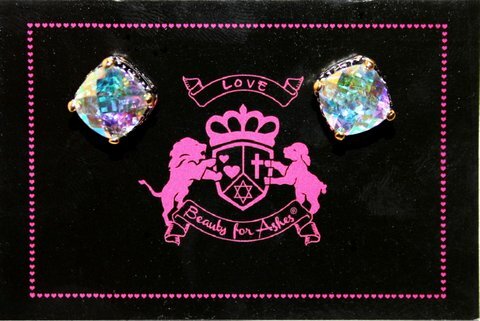 Beautiful Beauty for Ashes Boutique Jewelry presents these exclusive SPECTACULAR THRONE ROOM RAINBOW ICE CZ Earrings! Super Sparkly, and turn different colors (or appears to) as you move, depending on the lighting. 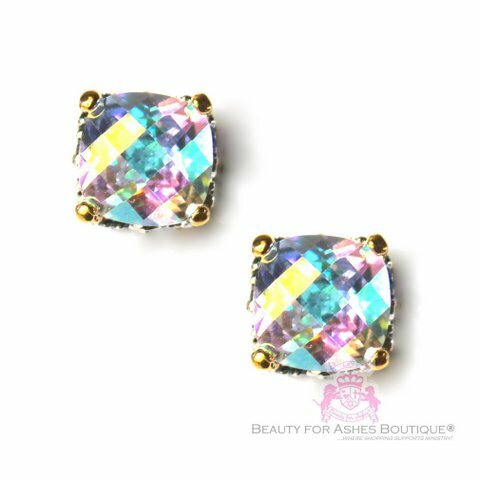 The stone size is a modest, yet bold 10mm x 10mm, and has a cushion-cut or checker cut (as some call it) aurora borealis CZ. The surround is solid brass with a thick coat of white gold rhodium plating and yellow gold plated accents in an old world intricate design! These earrings are Center Post style, which means your earrings won't droop at the edge of your earlobe, which is very flattering.